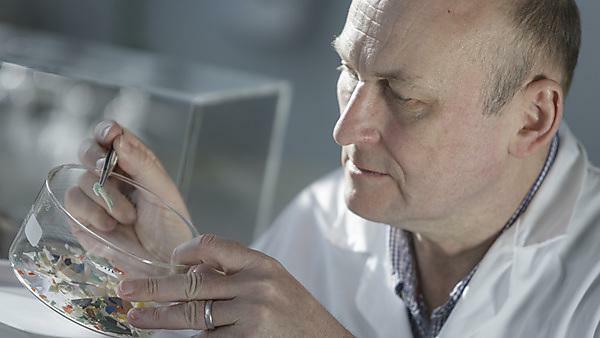 The academic who first coined use of the term microplastics to describe the microscopic plastic fragments found in our oceans has received a prestigious national award. Professor Richard Thompson, Head of the International Marine Litter Research Unit at the University of Plymouth, used the phrase in a prominent piece of research in 2004 and it has since become commonly used in both scientific and policy circles. Since that initial paper, he has been involved in key discoveries including the demonstration of the potential for microplastics to transport persistent organic chemicals to marine life, the global distribution of microplastic on shorelines and that microplastics move pollutants and additives to species thus reducing functions linked to health and biodiversity. He has now been presented with the 2017 Marsh Award for Marine and Freshwater Conservation by the Zoological Society of London, recognises those who have made contributions through fundamental science to greater understanding of marine and/or freshwater ecosystems. Before his seminal paper, Professor Thompson had already spent around a decade researching the impact of microplastics, and working to raise awareness of potential solutions. He has contributed to government legislation on single use carrier bags and the use of microbeads in cosmetics, giving evidence to parliamentary inquiries in which one politician referred to him as the “Godfather of microplastic research”. Professor Thompson is the second Plymouth academic to receive the award, as it was presented in 2013 to Professor David Bilton for significant research on the ecology and conservation biology of aquatic invertebrates.